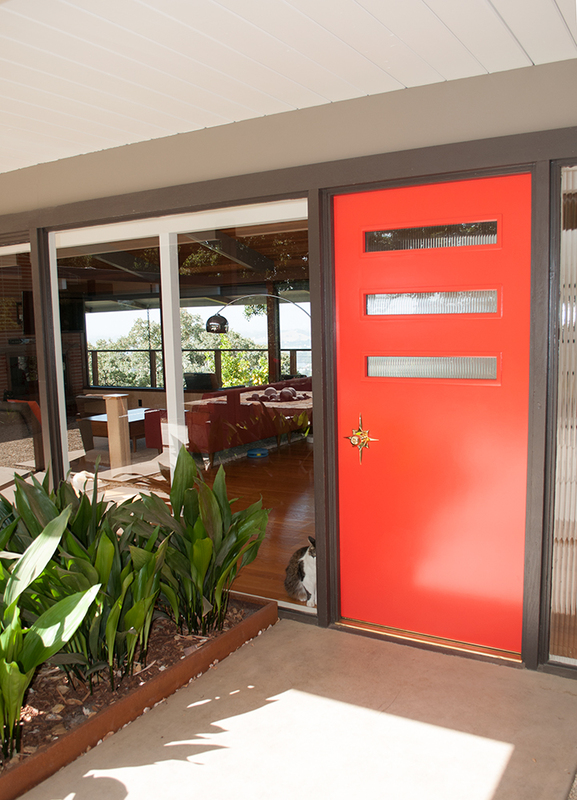 Over the last 4 years, we had the front door painted a bright red. But we always wanted to do something more ‘MCM’ with it. We thought we would be replacing it eventually, but our contractor warned us that the measurements were odd and he would have a tough time fitting in a brand new door. The fact that it was a solid – we think– mahogany, we didn’t want to replace it if we didn’t have to. Notice the small window on the right, which we had removed, as well as the door to the garage. I’m gagging a little looking at these. So THIS has been our door for the last 3 years. 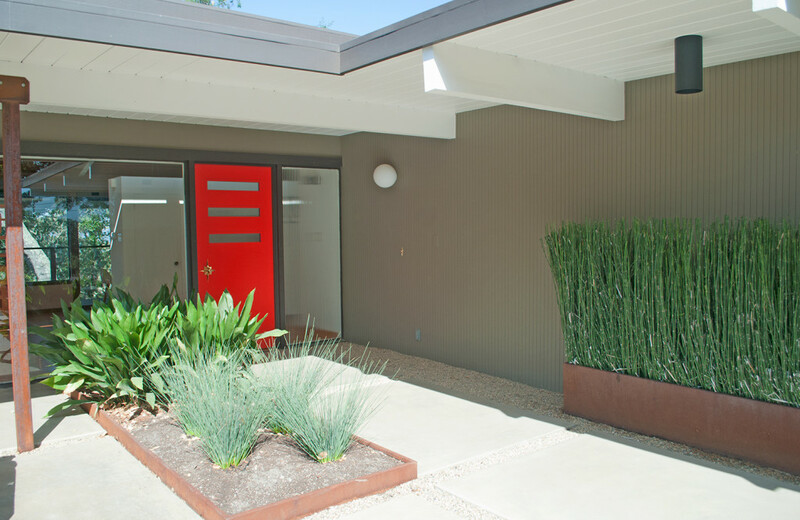 We had it painted Merlot Red, and added chrome mcm door fixtures from Rejuvenation. 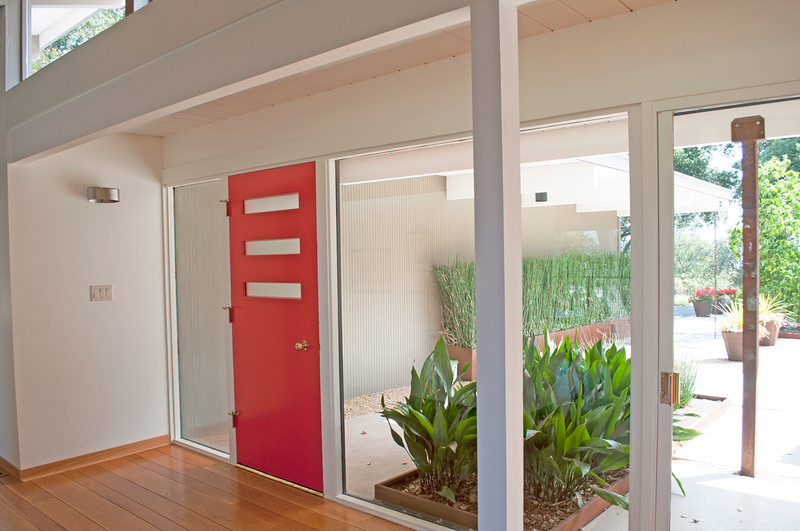 But we noticed that a lot of MCM front doors had window inserts, and that’s what we decided to do. We ordered a DIY window kit from The Millwork Market. (Great company to do business with, by the way! ). 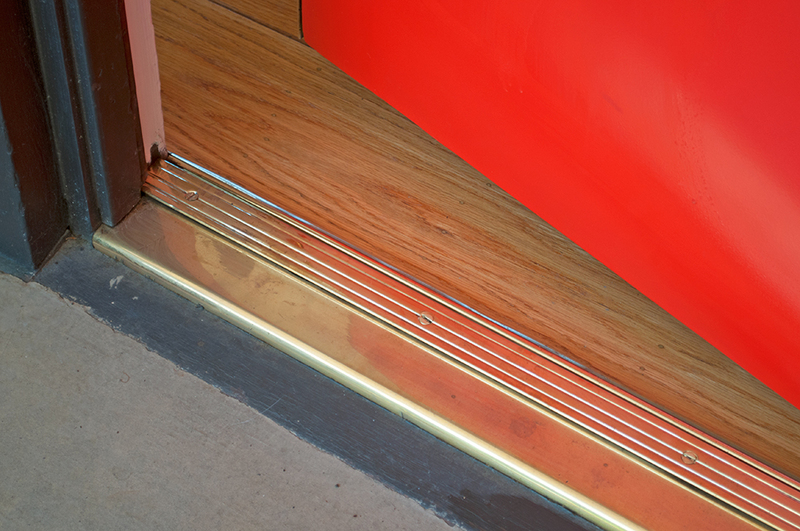 We chose reeded glass, as the window to the right of the door is also reeded. Then we had our contractor do the cutting and installing. Once they were installed, we had the door sent out to our painters location to be sanded down and painted again. 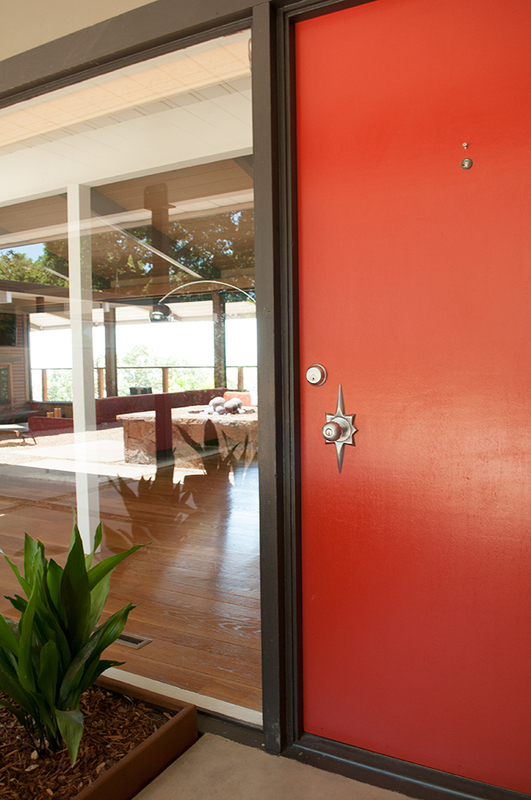 This time we went with an even brighter red – Benjamin Moore Redstone. But it gets better. When they took the door out, they asked us if we wanted the fixtures cleaned up as well. From the photo above, it just looks black. 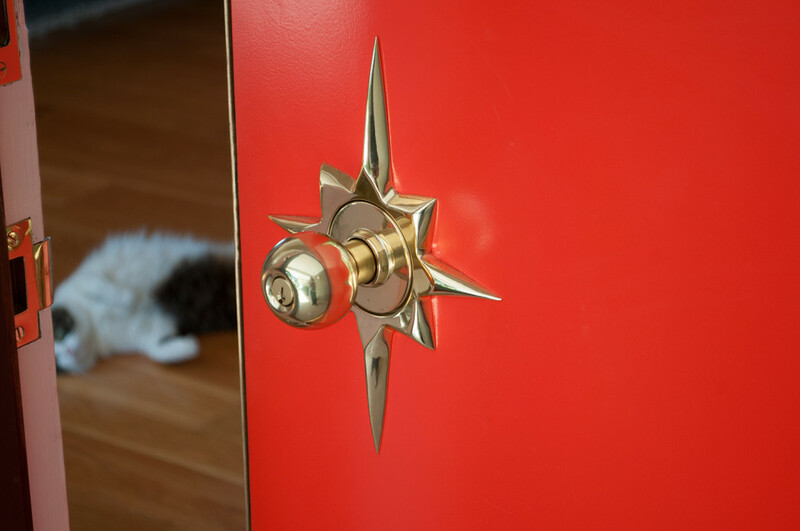 Well, it turns out the hinges and footer were solid brass – and our painter knew a guy who could clean them up. We had one problem with the window inserts. We couldn’t fit 4 as we originally planned because of the proximity of the door handle. Rather than having the spacing uneven, we opted for 3 above the door handle. Interior shot of the door before. That black metal footer is no longer black! 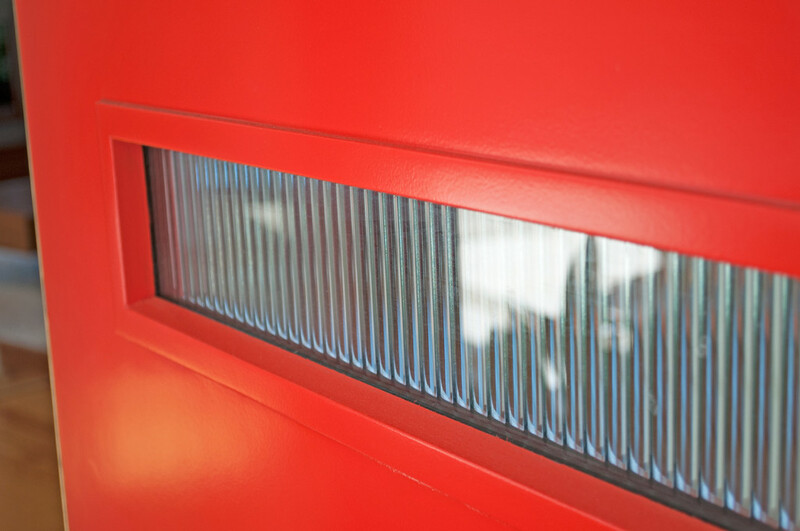 The reeded glass insert up close. Something is missing, though. What do you think? A fabulous but expensive bullet planter in the corner? Your door and the whole entry area look fabulous! My front door has clear glass, full length sidelights on both sides AND a peep hole. I wondered about that too! I have purchased the irregulars and they look and function fine for me – one is used mostly as a wine cooler for parties! Glad we are not the only ones with questionable peepholes. Thanks so much for the deal info. Now I just have to decide on which color! Your door looks fantastic! I love the new color and the window kit. The reeded glass is perfect. It’s wonderful that your hardware cleaned up like new. 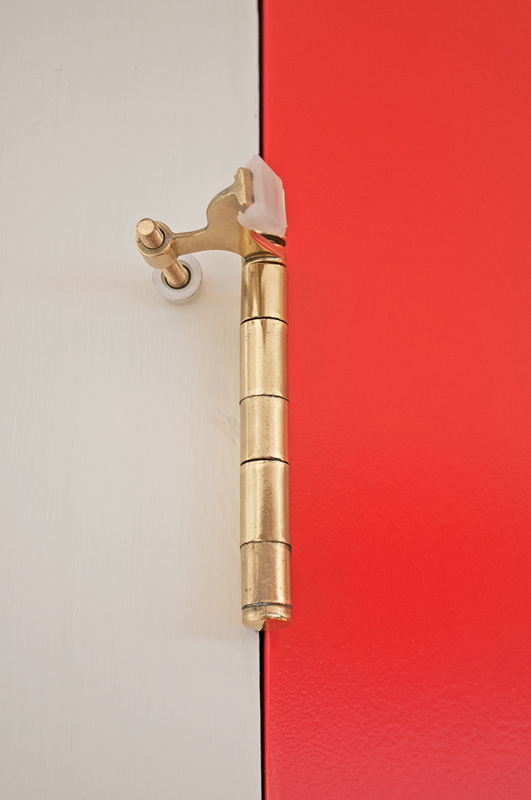 With brass that gorgeous, I’m sure you didn’t mind buying the new door set. I have a Hip Haven bullet planter and love it. We used to carry them in the store and may again soon. Thanks! We of course, HAD to buy the brass hardware to make everything match, but it’s been worth it. Everything looks so shiny and new – on a very old door! It seems everyone has a bullet planter but us. That’s it, I’m sold. I just found your blog today and I can’t wait to get caught up on all your renovations! I may be a tad late on your bullet planter suggestion but I would switch it to a Case Study planter (http://modernica.net/case-study-cylinder-plant-pot-with-standbrsmall.html) which I think would look better in the corner than the bullet planter. Thanks so much for visiting my blog. I LOVE the Case Study planter, but with our brutal sun, I think I would want to put it somewhere indoors so it would not get ruined. I did decide to go with 2 bullet planters and will update soon with a picture. I had to order mother-in-law tongue (what a name for a plant) for them. What an amazing job you’ve done! Not only with the door but your home! Did I say WOW? Fabulous! Thank you so much for posting this and sharing with us! I like the look with the new glass, and the red really pops! I also like your new (updated?) blog theme…the images at the top are a nice addition. I need to work on adding something like that (as well as a before and after gallery) to mine. Thanks, Douglas. I switched back to WordPress and downloaded the software and paid for hosting so I could have more customization. It was worth it. 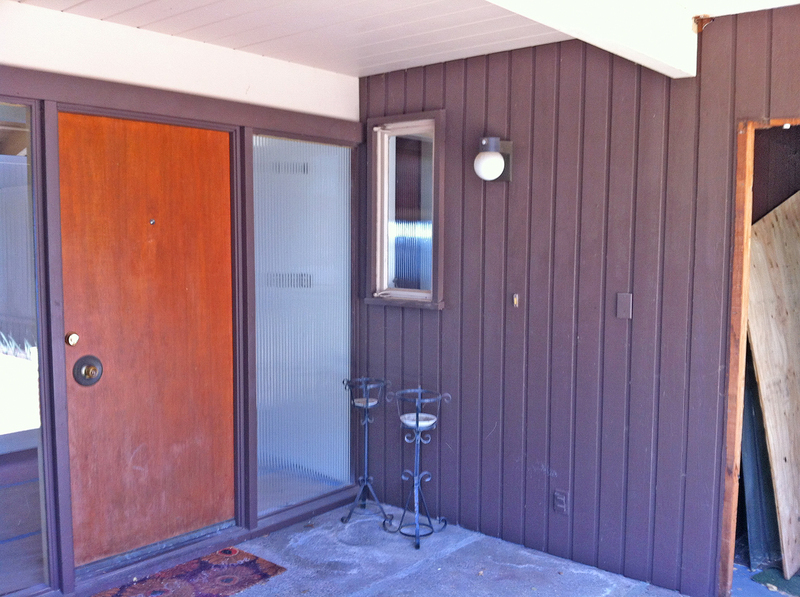 We have a midcentury ranch home and are looking at buying a lite kit for our wood door. I am curious about the kit from Millwork Market. It looks great in the pictures. What are your thoughts on the craftsmanship of the kit? Was it easy to install and get a nice tight/secure fit to your door? Your feedback would be greatly appreciated. Thanks. Hi Joseph, Thanks for your comment! I can tell you wholeheartedly that it looks great in person as well. The reeded glass choice was perfect for us. The company was great to deal with. We were actually going to buy a whole door but because of the odd size, they actually made the suggestion for the kit when our contractor found out doing a new door wouldn’t work…I didn’t even know that was an option! It includes instructions with the kit and the company followed up with us after we received the kit. As for installing, it took our contractor less than a day – only a couple of hours and it was pretty easy for him to do. I was thrilled that we could keep our old door, and ‘funk it up’ a bit with this kit, rather than spending the money to buy a whole new door. But we did decide to spend the saved money on getting the door sanded down and painted along with the inserts. Hope this helps! Love what you’ve done to the house! 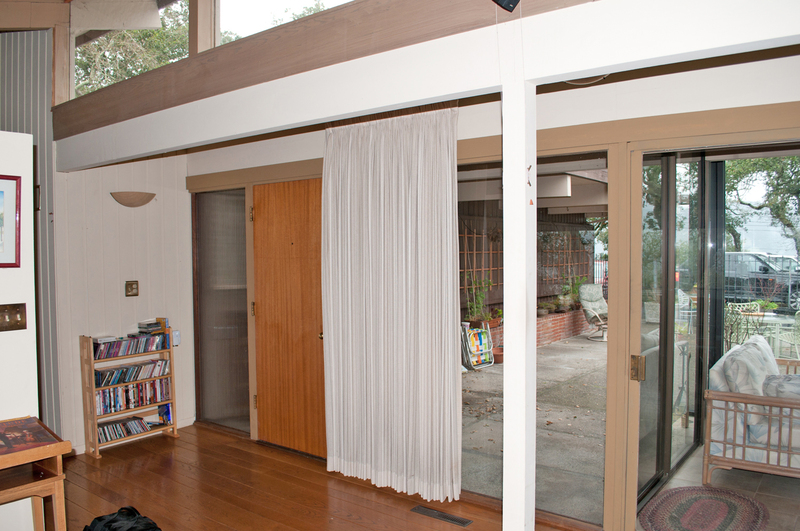 My husband and I own a 1959 mid century on a hill in Santa Rosa. Seeking your advice on landscaping. We’d like to redo our landing and walkway. If I might pick your brain–who did you use for that clean concrete aesthetic? Hi Carol, Thanks very much! If you are wondering about who designed it, initially we hired landscape architect firm Roche + Roche to come up with a plan for our landscape. I had told them I wanted those types of concrete pads, that are so common in MCM homes. (If you are not yet addicted to Houzz.com, check it out – you will get plenty of examples and ideas). They came up with the plans. The actual concrete work was done by Ace Concrete in Napa – 2680 Jefferson St Ste-A Napa, CA 94558 Phone number (707) 927-5427. 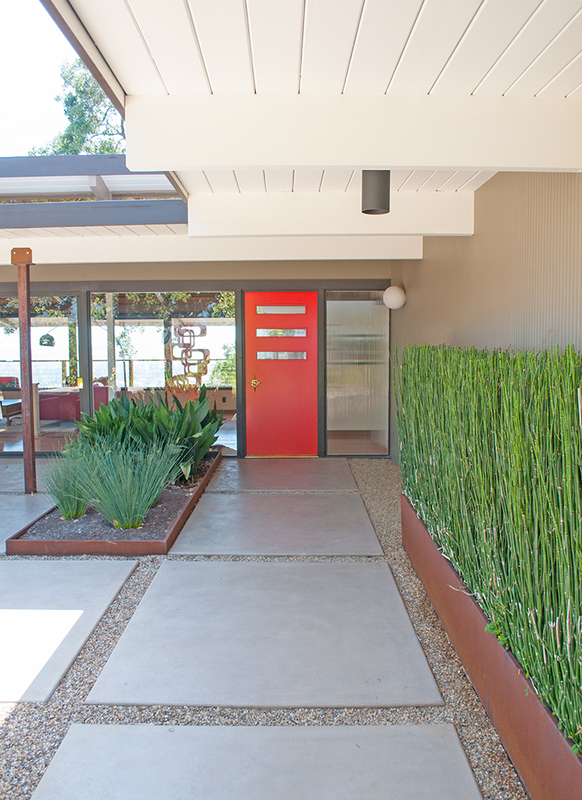 The concrete is an adobe color with a smooth finish and a clear seal. You are welcome to stop by if you are ever in Napa, just contact me at cdnmich at gmail dot com. Thank you so much for the referrals and information. We bought our place two years ago–we are the second owners and are being very cautious about “next steps” for this gem. Your remodel is so inspiring, and am very happy to have found this site. My husband manages a small Coombsville winery; indeed–we’ll take you up on that–as we’d be thrilled to see your fantastic home. 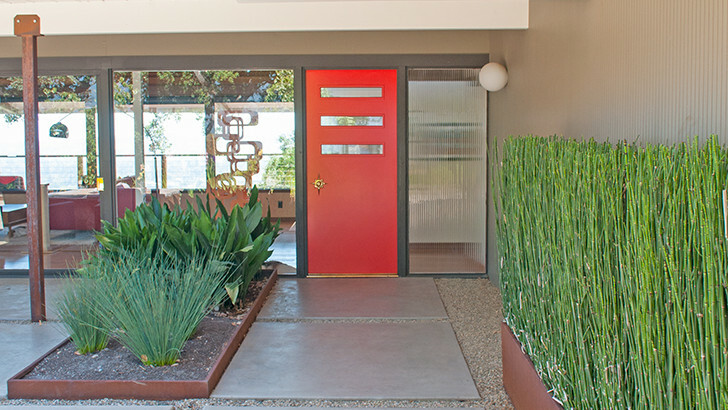 what is the plant in the long planter to the right of the front door. the long tall plants? I believe you are referring to the horsetail. Great plant, but has to be contained or it spreads. 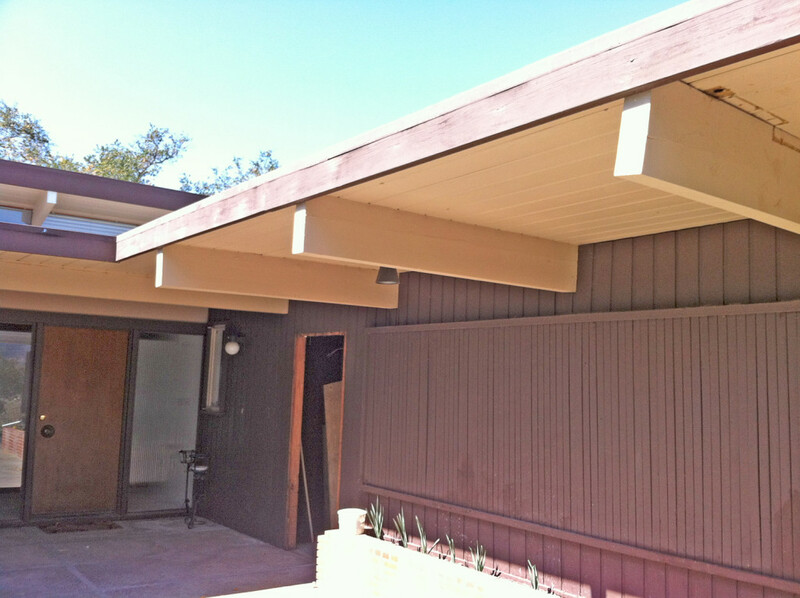 Hi, Repainting my MCM now, what color are the walls and fascia trim here? Hi, the base color is Benjamin Moore ‘Cromwell Grey’ and the fascia is Kelly Moore ‘Oxford Brown’. I think I am going to have to post this info on my home page because this is probably the most asked question! thx so much! …really love the combo!